After a lousy experience with The Witcher 2's DRM, developer CD Projekt Red has pledged against the use of such schemes in its future games. 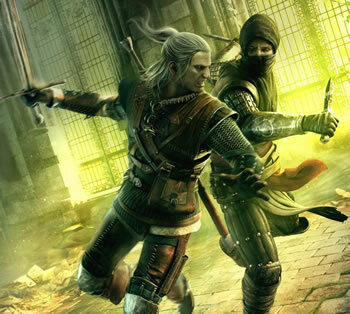 Speaking at GDC 2012, CEO Marcin Iwinski dismissed DRM as an effective anti-piracy tool, noting that the SecuROM-"protected" version of The Witcher 2 was cracked in only two hours. In fact, pirates went out of their way to crack and distribute the DRM-laden retail copy. "What really surprised me is that the pirates didn't use the GOG version, which was not protected. They took the SecuROM retail version, cracked it and said 'we cracked it' -- meanwhile there's a non-secure version with a simultaneous release," said Iwinski. "DRM does not protect your game. If there are examples that it does, then people maybe should consider it, but then there are complications with legit users." Many reported negative encounters with SecuROM on The Witcher 2, including reduced frame rates and loading times. In one user-conducted test, the SecuROM version took 32 seconds longer to launch, 8 seconds longer to save and ran nearly twice as slow. CD Projekt Red promptly responded to complaints last May by removing the DRM with patch 1.1, which reportedly boosted performance by as much as 30%. "Our approach to countering piracy is to incorporate superior value in the legal version. This means it has to be superior in every respect: less troublesome to use and install, with full support, and with access to additional content and services," said CD Projekt Red employee Adam Badowski at the time. He justified the DRM by noting that the company wanted to prevent its game from being pirated before launching. Along with swearing off DRM, CD Projekt Red halted its pursuit of pirates earlier this year. In November 2010, months before The Witcher 2 even shipped, the studio warned that it would hunt folks illegally sharing its upcoming RPG. True to its word, the company tracked IP addresses torrenting the title and mailed settlements demanding some $1,190 (essentially the scheme popularized by the US Copyright Group). Fans disapproved, not least because of the potential for innocent users to be wrongly accused (there's no way to match activity from an IP address to a specific person with 100% accuracy). In January 2012, Iwinski apologized for resorting to "pay-or-else" tactics and promised no innocents were mistakenly targeted. He promised to stop using the scheme for the sake of maintaining a positive relationship with players.